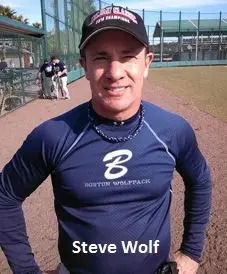 January 18, 2016, Orlando, FL – The Boston Wolfpack sure didn’t enjoy seeing their Holiday Classic tournament end before the championship game a year ago. So they made sure it didn’t happen again. A year removed from a semifinal loss that ended a string of seven consecutive championships, Boston closed out an undefeated week with a 10-4 comeback victory over the Miami Marlins in the 45-Over championship game. For the first 4-½ innings, it appeared to be nearly impossible. Getting a trio of runs in the third and another in the fourth, Miami grabbed a commanding 4-0 lead. And, with Jim Eddy escaping potential jams early, time was getting precariously short for the Wolfpack to regain their title. But then, like a giant slowly awakening, the game swung completely in Boston’s favor. It wasn’t one play or one pitch, but a combination of them that returned the Wolfpack to their familiar position atop the tournament standings. An inning later, four more Boston runs turned a struggle into a blowout. Kenny Craddox scored on Jose Delgado’s single to left, before an infield throwing error, a well-placed Dave Benedict bunt single and a wild pitch added three more. By the time the inning was over, Boston held a commanding 9-4 lead and was just nine outs from victory. Miami entered the final game confident, thanks to a 3-0 round-robin record and playoff victories over the Jacksonville Hops and defending champion Chicago Royals, 7-1. Jaime Hernandez (2-0) went the distance to avenge last year’s title game loss to Chicago. Meanwhile, Boston also entered undefeated after topping All-Star Academy 8-1 and then the US Cruisers 5-2 in the semifinals behind Mike Smith’s (2-0) complete game effort. WP: Mercado. LP: Eddy. Pitching: Eddy, Hernandez (6), Teimino (6) and Sladky (M). Mercado, Benedict (8), Delgado (9) and Rousseau (B). 2B: Moise (B). 3B: Bastian (B).